This online Animal Wisdom Class Series is based upon indigenous 9 directions traditional native teachings and their corresponding animal totems for each direction. Class size is limited to 20 people per class series, which is then further broken down into sub-groups of just 4 students each for the ongoing monthly channeled chats. These sub-groups meet once monthly for personal one-on-one time with the channeled entity known as Michael. Michael will, at this time, offer insights into the animal totem itself, it's related direction, function, significance and purpose in your life, as well as how and why that particular animal totem may have come to occupy this position for you at this time in your life. This class runs for 12 consecutive months, broken down into 4 Modules of 3 months each. The class includes the monthly study of each of the 9 animal totems, plus one month of "introduction" to the class, one month for full integration, and one month for "closure and completion." Each student will take just one direction and the corresponding *personal* animal totem each month, and will spend the entire month studying, researching, journeying with and getting to know that animal totem very well indeed. Students are encouraged to journey once a week with their animal totem for that month, for a total of four journeys with each animal totem per month. They will then record at least ONE of these four journeys in their personal blog each month. Students may record all of them as well, if they choose, however, they are required to blog just one of their journeys each month. Keeping a journal of your animal totem journeys is highly recommended and encouraged, however no one need ever read them, if you choose. The class series is facilitated in a private online study group environment wherein you can feel safe to explore your connections with your animal totems, with yourself and your fellow students in a fun, warm, nurturing and supportive online environment. Sub-group (of 4 people each) meetings run approximately 2 hours once a month, on a day and time that works best for your study group. This is the only "scheduled" online time required. You will meet with your fellow sub-group classmates and with the channeled causal plane entity known as Michael. The rest of the class is based upon independent study and self-motivatated research, exploration and learning. For those who are students of the Michael Teachings, Michael also gives additional information based upon their causal plane perspective on how their own teachings may be applied to the traditional 9 Directions "sacred circle" system in order to gain even deeper insights into your life. Each direction corresponds to a particular overleaf within the Michael Teachings system, which sheds additional light on the indigenous teachings perspective. There are also resonances that can be examined from the Michael Teachings perspective relative to soul age perceptions, internal monads and casting placements, (aka: Essence Dynamics). Together, these two systems offer the student a more comprehensive perspective from which to gain a greater depth of understanding and profound insights into who they are in essence, their life path choices, personal goals, challenges, innate talents and abilities and opens up a world of possibilities that they may have not yet discovered or even considered before! It's striking the things people can see in their animal totems that are not always "visible" to them simply looking at themselves from the perspective of their own inner or outer "mirrors in life. Looking at ourselves from the viewpoint of our animal totems perspective can make it so much easier to "own" qualities we may not even know exist within us, and to know and experience the meaning of truly "unconditional love." We begin first with our own animal totems and with ourselves, and then extend such compassion and undertanding out to others in our lives. It is a truly wonderful way of claiming and knowing who you truly are through the eyes of the animal totems who have chosen to work with YOU personally in this lifetime! Abundant resources are provided for use in researching, studying and getting to know your animal totems, their messages, meanings and medicines, and how they serve you in this life. Thus, there is not a huge online time requirement to meet each month in order to participate in the class. You will get out of it, however, what you are willing to put into it, of course. Giving and receiving support, learning and growing with, through and from your fellow classmates also adds an extra dimension of fun, stimulation, discovery and additional insights that you might not get studying the same information on your own. Like so many of the "good things" in life, they're always so much better when they're shared. 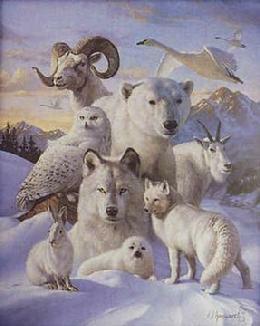 Each and every person on earth has nine power totem animals that symbolize the medicine they carry in their Earth Walk. 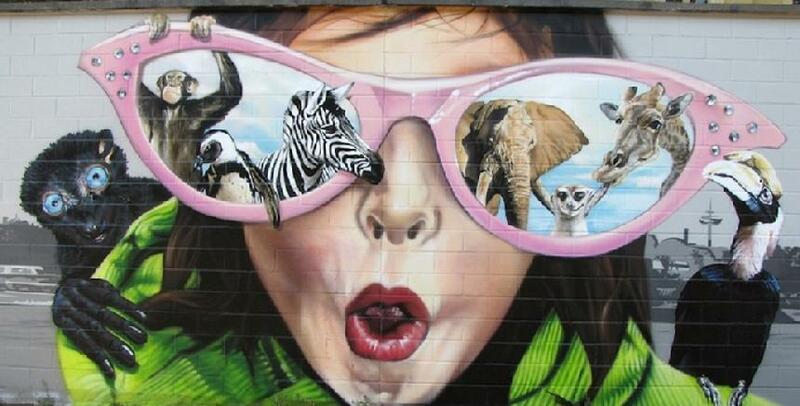 These animals or creature beings represent each person�s innate talents, abilities, challenges and dreams. For instance, if a person is linked to a Wolf as a power animal, that person is natural born a teacher, pathfinder, innovator, and self-starter. This does not necessarily mean that a person has acknowledged those gifts and is using them to the fullest. It can mean that Wolf is there to bring that person to an awareness and a greater understanding of those talents. As you come into the Earth Walk, there are seven directions surrounding your physical body. These directions are East, South, West, North, Above, Below, and Within. The direction called Within exists within you, but it also surrounds you, since the entire universe is contained within your consciousness. You have a totem animal in each of the seven directions to teach you the lessons of these directions. The other two animals, which make up your nine animal totems are the ones which are walking at each side of you at all times, and which may possibly have been coming to you for years in your dreams. If they have not come to you in dreams, they may be animals that you are drawn to but which have not appeared amongst the other seven animal totems. You may find that these last two creatures will appear for you at a later date. The two that walk by your side may be from any part of the animal kingdom on Mother Earth. EAST: The animal in the East direction guides you to your greatest spiritual challenges and guards your path to enlightenment. SOUTH: The animal to your South protects the child within and reminds you when to be humble and when to trust, so that innocence will be balanced in your personality. WEST: The animal in the West position leads you to your personal truth and inner answers. It also shows you the path to your goals. NORTH: The North animal gives wise counsel and reminds you when to speak and when to listen. It also reminds you to be grateful for your blessings each and every day. ABOVE: The Above animal will teach you to honor the Great Star Nation, it will also remind you that you came from the stars and to the stars you will return. The animal is also the sentinel of the Dreamtime; your personal access to the other dimensions. BELOW: The animal Below will teach you about the inner Earth, and how to stay grounded and on on your path. WITHIN: The animal Within will teach you how to find your happiness and to be faithful to your personal truths. It�s also the guardian of your sacred space, the place that is yours alone and is never shared except by invitation. RIGHT SIDE: The animal to your Right protects your male side and teaches you that, no matter where you turn, it will be your Father Protector within. This animal also carries your courage and warrior spirit. LEFT SIDE: The animal to your Left is the protector of your female side and teaches you that you must learn to receive abundance as well as to nurture yourself and others. The Left-side animal is also your teacher about relationships and mothering. This video represents the culmination of our Animal Wisdom class studies from 2002 - 2004. We took one animal totem per month and spent that month journeying with that animal essence, learning about their habitats, attributes, special "medicines" and how that essential energy showed up in our own daily lives. We also received channeling from the causal plane entity known as Michael, who has put forth a body of channeled information called the Michael Teachings. (Visit: The Michael Teachings page for more information.) 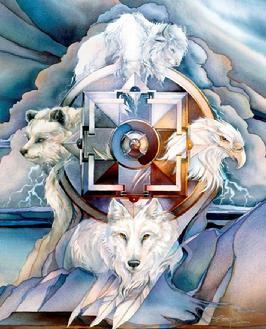 Michael channeled personal information for each student, each month, on how that animal essence came to occupy that particular position in their Medicine Wheel and other pertinent information. The class lasted 15 months, and 12 people took the initial course, wherein the new information was initially brought forth and "unpacked" through our monthly group channeling sessions. Have Your Personal Animal Totems Channeled Now! Even if you're on the waiting list for the next Animal Wisdom Class Series, you can still have your 9 Directions Traditional Animal Totems and/or your 13 Positions Support Circle Animal Totems channeled for you NOW! If you would like to have them channeled for you NOW, please let me know through using the FORM BOX at the bottom of this page and then you can simply order them through the PayPal link provided below, and I will be notified when the payment has been made. I ask that you provide a picture via email which is used for focusing purposes when the animal totems are channeled for you. Please use the CONTACT ME link to email your picture at the time of your payment. Your animal totems reading will be emailed to you within 2 weeks of placing your order. Medicine Wheel or a "Sacred Circle." and a book is in progress as well! Animal Wisdom Classes Fill Up Fast! To REGISTER, or to get on the WAITING LIST for an upcoming class series, please email me through the contact form provided below. I will email you with further details, a brief class synopsis and the schedule of upcoming classes.